Meter seals are more specialised product range combining durable, weather and breakage resistant plastic and a stainless steel wire cable. Most popular range for utility meter and gaming applications. We are the high quality Meter seals manufacturer and supplier. The Click Meter Seal is a completely transparent plastic seal. 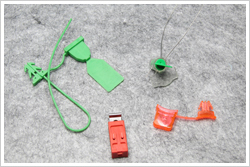 The transparent plastic permits the integrity control of the locking mechanism. It has a bridge connect the clicker and the capsule. The Anchor Meter Seal consists of a hollow capsule and anchor type insert, connected by a thread. Upon insertion, the legs or barbs become permanently retained behind the inner stops of the capsule, so the anchor can not be withdrawn. The Twister Seal is a durable plastic and wire seal ideal for securing all kinds of utility meters. It has an one directional rotatable locking mechanism to prevent extraction of sealing wire from its body. The rotating handle can be snapped off after application to prevent any manipulation.